Kyphosis comes in varying degrees. Depending with the severity of the ailment, a person may have an excessive spine curvature. This makes some people experience pain, stiffness, tender back or tiredness. The back pain can get more severe as the body tries to compensate for the abnormal curvature. If you don’t have time to go through this best kyphosis brace review post, check our top pick below. Kyphosis tends to get worse over time. Therefore, it’s important to stop it from progressing as soon as you can. There are multiple factors known to cause kyphosis. The most common ones are poor posture and age. Apart from these two, kyphosis may be caused by abnormal development of the spine and malformation of the vertebra. In the following kyphosis brace review, we outline the best products you can use to naturally treat the condition. The TOROS-GROUP Posture Corrector is recommended for anyone suffering from winged scapula, lordosis, kyphoscoliosis, or kyphosis. This is one of the best kyphosis brace options for preventing progression of spinal curvature and reducing scoliosis decompensation. The TOROS-GROUP Posture Brace ensures the spine is rigidly in the correct position throughout the day. However, do not tighten it very much. Otherwise, it will do you more harm than good. When wearing the Kyphosis brace, you will not feel a lot of pain. The pressure on your discs will be relieved by the good posture the brace will help you maintain. It is recommended to wear the TOROS-GROUP kyphosis brace for between 3 to 4 hours a day. Also, when you first get the brace, start wearing it for about 20 to 30 minutes a day. You should then adjust it progressively over the weeks until you can wear it for the recommended 3 or 4 hours. The YK Care® Shoulder Corrector comes in different sizes. Therefore, you will find one that fits you well. The adjustable kyphosis brace will help you maintain correct posture and prevent slouching. The YK Care kyphosis brace is unisex and does not to restrict you from doing your daily activities when wearing it. The brace is made of high quality neoprene and has a breathable mesh. The YK Care® Back Brace is a great option if you are looking for a kyphosis brace that you can wear directlyon the skin or over a shirt. The Armstrong America Back Brace is also one of the best kyphosis braces in the market. 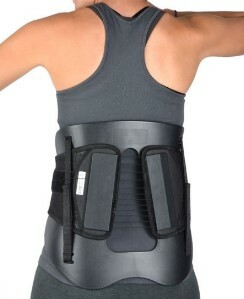 The back brace is made of high quality materials and has dual adjustable tightening straps. Therefore, you can be sure of fitting in the brace no matter your body size or shape. The posture brace provides a warm sensation when worn. Wearing the Armstrong Amerika Posture Brace helps to relieve back pain and improve your spinal curvature. The brace pulls your shoulder back to align them with the spine. This relaxes the shoulder and neck muscles. The Cybertech Medical back brace improves compression of the thoracic back and consequently, your posture. This is a great brace for people with kyphosis. The Cybertech kyphosis brace features a patented mechanical pulley system that provides the necessary compression. The brace also has an aluminum posterior frame for supporting your back. The Cybertech kyphosis brace looks like a backpack and has closures on the shoulder straps and across your belly. The BeFit24 posture brace can be used in many situations. For example, if you have undergone surgery or have an injury, the brace can help with mobility. You can also wear the brace while seated at a desk. Moms can use it to carry their babies. When wearing the BeFit24 kyphosis brace, you will stand and sit straight. When you are in the correct posture, tension and stress on your back, shoulders, and neck reduce. 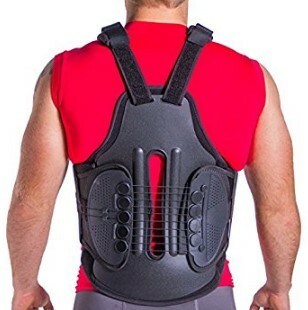 This posture corrector is made of quality, comfortable and durable materials. The Comfort Posture Corrector can be used by anyone suffering from lordosis, kyphoscoliosis, kyphosis or winged scapular. The posture corrector is unisex and can also be used by kids. The Neo G Back Support brace helps to stop early stage thoracic kyphosis. This posture corrector is suitable as a pre- or post-operative rehabilitation it. The corrector also correct slumped and rounded shoulders to improve posture. The Cybercross Thoracic spine brace is meant for people suffering from kyphosis and osteoporosis. The posture aid has a 3-pointsystem that holds the spine in hypertension to promote proper spine alignment. The kyphosis brace has a pubic pad and a sternum that easily move with your body. Pain is not always a symptom of kyphosis. You may be suffering from the condition without feeling any pain. However, this does not mean you should leave it untreated. You can use the best kyphosis brace to correct your posture and relieve any back pains. Previous article Where Can I Get a Back Brace or Posture Corrector?